These new earphone models are the Plattan 2 that will retail for $50 a pop, the more expensive $119 Plattan ADV Wireless, and for those who are on a budget, the $49 Sumpan. Why the shade of Comet Green? Well, Comet Green is described to be bright like the dusty tail of a shooting star, where this curious shade of pastel ought to be able to provide listeners with any thrill that they seek. Wearing a pair of earphones in Comet Green will certainly add a surprising color burst to everyday routines. As for Cosmos Purple, it arrives in a deep shade that is wise like the eye of a nebula, which ought to be able to bring about a strange new order to one’s earthly mannerisms. Last but not least, there is Eclipse Blue, which is comfortable to wear in its own gemlike shadow, and is hypnotic to look at. 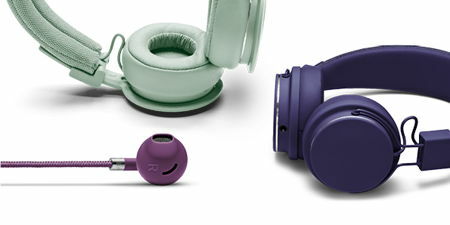 There are five standard Urbanears shades in the market: Indigo, Tomato, Black, Dark Grey, and White. Apart from these staples, there will be half a dozen seasonal colors that are set to join the mix every single year, allocating three for Fall/Winter, and three for Spring/Summer. Definitely a little bit of something for everyone from time to time to be fashionably chic even in the world of tech.